We are so very close to our fundraising goal, so we are keeping our campaign active for a few more days to see if we can reach it. Please consider making a gift of any amount! Thank you to everyone who contributed! Credit card donations of any amount can be made through the Donate button below. To mail a check, please contact us at rpl@readplaylove.org for the mailing address of our treasurer. Read Play Love's mission is to empower children through the arts and create an inclusive culture of love. Read Play Love is a non-profit 501(c)3 organization, EIN 26-3437653. ​Help us reach our 2018 end-of-year goal. Every dollar counts! ​All gifts are fully tax-deductible to the full extent of the law. 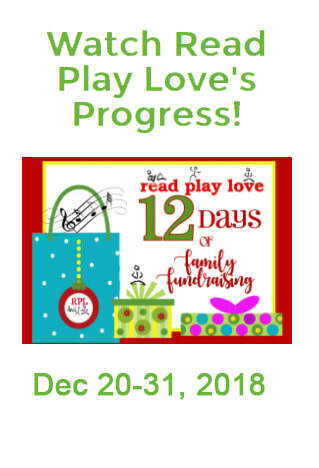 Your gift of ANY amount helps support Read Play Love as we move toward a new location for early 2019. 1. Carols for a Cause -- Select a family to honor with a gift of any amount, and receive a holiday greeting video from the family! 2. Magical Memories Giving Program -- Celebrate your child's memories at Read Play Love with one of these special bundles!